The rooftops were dusted with fresh powder and the air was crisp, making the simple, cozy cabin even more enticing just knowing that there was a fireplace heating the room. We quickly settled in and opened our bottle of wine, only to discover that there were only mason jars for drinking glasses in the room. I’m sure had we asked, Jess and Jake would’ve offered us wine glasses, but as we quickly adjusted to the warmth inside the cabin there was no way we were leaving. It felt rustic, and trendy, to be drinking out of them anyway. After a night of peace and quiet, deep sleep and cuddling by the fire we were eager to get outside for the bald eagle viewing raft tour. A quick walk from our cabin to the main reception area brought us to hot coffee freshly roasted at Gallileo Coffee Company and daily baked muffins from Fergie’s Cafe. All of the food served at Fergie’s is prepared with locally-sourced ingredients from farms such as Rancho Rojo Pez, Stony Mountain Farm, Fern Alley Market Garden and Good Time Farming. After our breakfast and introductions it was time to get ready for a morning spent coasting down the river on the raft. 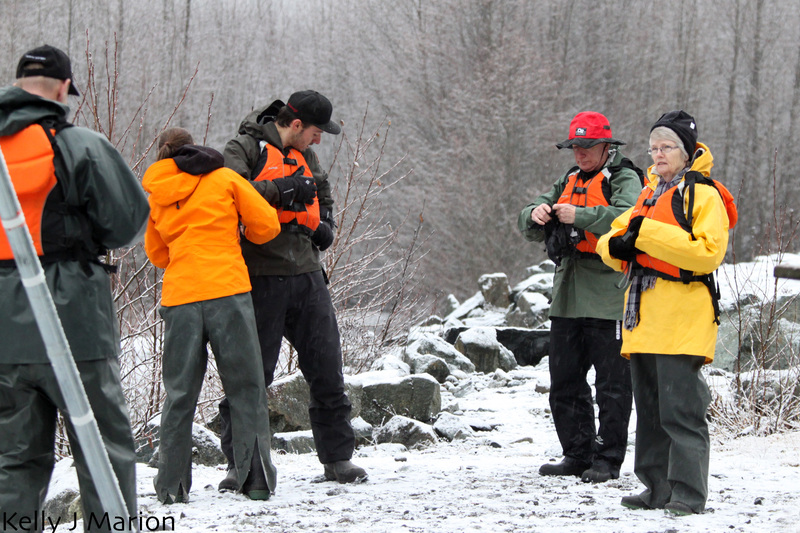 Some people, from our small group of five, bundled up in gear provided by Sunwolf while others wore their own boots and water-resistant attire. Cameras in hand we excitedly loaded in to a van where we were taken down to the other end of the river before buckling in to our life jackets. As we waded in to the water in our boots we carefully hopped in to the raft that is used for whitewater rafting in the summer months. 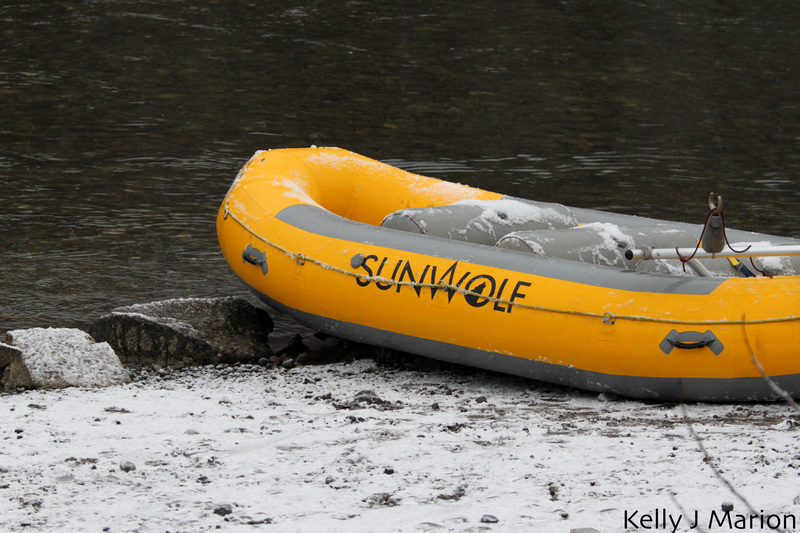 Jess Freese, co-owner of Sunwolf, assured us that the current rapids were small where we were going and that to that day they had never had anyone go overboard. Were my teeth still clenched? No, but they will be when I go back in the summer for my first whitewater rafting experience. The large snowflakes created a magical and somewhat surreal setting as we set off on our morning eagle viewing tour with Jess. Her significant other, Jake Freese, did not join us, but departed with a cheerful goodbye as he drove the van back to Sunwolf. As we coasted down the river, it was incredible to see the mass amount of eagles that have made Brackendale their home over the cold winter months. 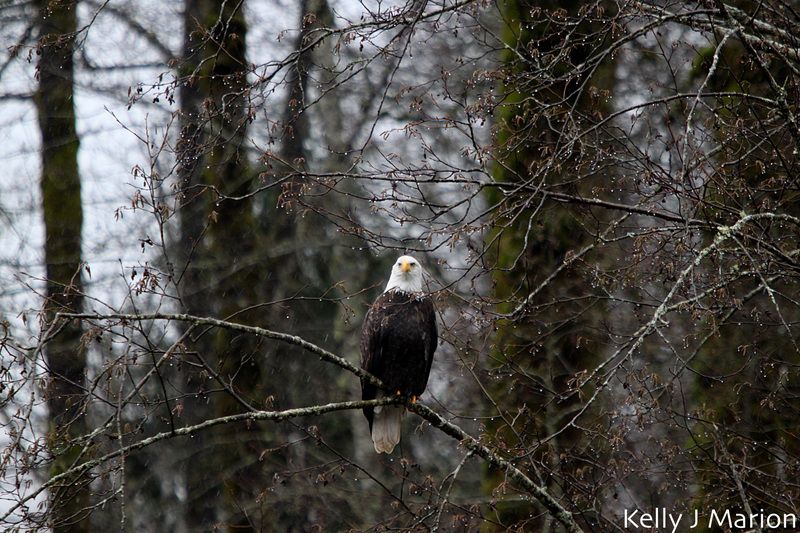 Since the peak bald eagle viewing is from mid-December to mid-January we were right in the acme of best viewing times. In a single tree there were often six to ten eagles perched atop a branch, watching us as we snapped photo after photo in between sips of creamy hot chocolate. Jess explained to us that snowy days are often the best for catching the eagles hanging out in the lower branches, which was proven by what we saw. In 1994, Brackendale had the highest concentration of overwintering Bald Eagles in North America. 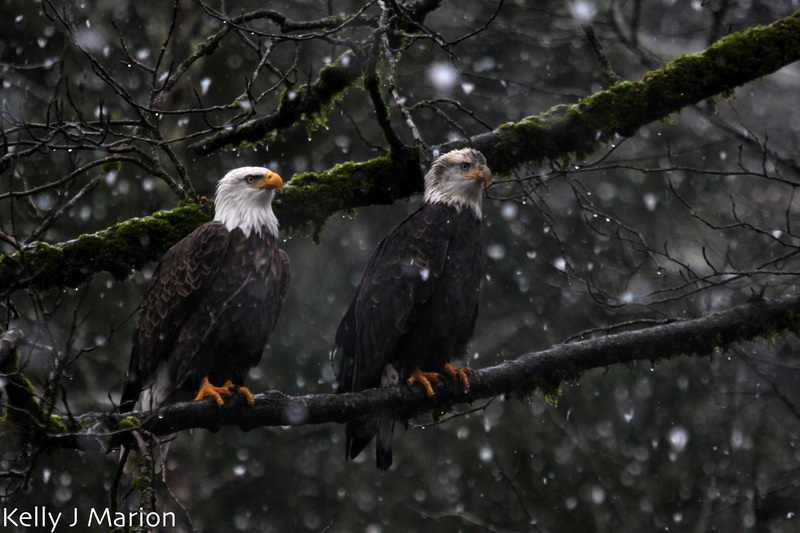 In one day 3,701 eagles where counted along the 15 kilometre stretch of the Squamish Valley. The eagles congregate to feed from the spawning salmon that during our tour, laced the bed of stones beneath the crystal clear river. After the incredible, but chilly tour, we regained our warmth and quenched our appetite with hot beverages and a hearty lunch. A thick beef stew with crispy fried onions was served with corn bread, olives, and hot peppers. For dessert we had gluten-free banana bread that was moist, addicting and better than most restaurant banana breads that I’ve tasted. The meal was prepared on-site, like the muffins, at Fergie’s Cafe, and delivered to us in the main Sunwolf lobby, heated by a crackling fire. Jess ate lunch with us, answering any questions that we had about bald eagles or Sunwolf, although a healthy amount of information was given during the tour. She proved to be very knowledgeable on the subject and her experience with hospitality, rafting and wildlife was apparent. The Bald Eagle Viewing floats run from November 15th to February 15th so you still have plenty of time to check them out. They cost $100 for a half day including transport from whistler if needed. The tour, that holds a maximum of six people at a time, starts shortly after 10AM when everyone is ready to go. For more photos of the cabins and the bald eagles check out my Sunwolf set on Flickr. Old logging maps dating back to 1910 show the location of a logging camp, called “Yapp’s Camp” on the current Sunwolf site. In the early 1950’s, the Ferguson family moved in and ran “Fergie’s Fishing Lodge,” a bustling lodge with cabins and a motel that served the Vancouver flyfishing community, who initially arrived by steamboat to Howe Sound. In 1958 the road between Vancouver and Squamish was completed and Fergie’s became a thriving community of young fishermen, many of whom lived in the cabins whilst they found more permanent accommodation in the area. In 1995 the site changed ownership and became “Sunwolf Outdoor Centre”, introducing rafting trips to the resort. As interest in running the resort diminished, the centre came on the market and a chance drive by rafting guides and best friends Jess Freese and Tanya Slater, started the next chapter of the resort. With a vision that recognized the immense potential for the resort, the ladies returned home and quickly convinced their partners that purchasing the resort was a must. In July 2010, Jess and Jake Freese along with Tanya and Andrew Slater moved in and started working immediately. 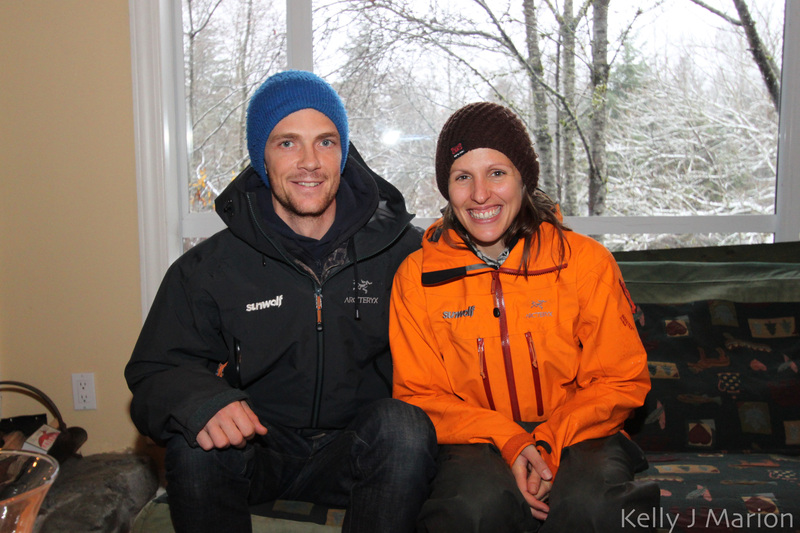 Jess, Jake, Tanya and Andrew are friends that share a love of rafting, guiding, and exploration, while also sharing ownership of Sunwolf Outdoor Centre. With an outstanding and impressive combination of experiences, talents and qualifications, they make a formidable team in an exciting industry. Jess is known as the smart and empathetic one, Jacob as the thoughtful and humorous one, Tanya as the energetic and passionate one and Andrew as the strong and genuine one. Their personalities may differ incredibly but the outdoor enthusiast in all of them brings them together to offer guests a unique experience with fantastic hospitality. For more information on Sunwolf check out their website. ← A New Year….A New You?